Remedy’s time-bending thriller and Codemasters’ action racer join the massive Xbox Game Pass library. Xbox Game Pass has accrued a massive number of games as it is- it touched 180 games in July, and since then, many other games have added to that number, including the likes of Fallout 4, Rocket League, DOOM, and RAGE . In September, Microsoft will be adding even more games to their catalog, and they have now announced what those games will be. There will, of course, be Halo: The Master Chief Collection, which was announced to be joining Game Pass quite recently, and also received a massive update that added on 4K resolutions, HDR, and a lot more just a couple days back. This also means that all Halo games, other than Halo: Reach, are now available in the Xbox Game Pass library. Other than Halo, though, a couple more major games are part of September’s update to the library. 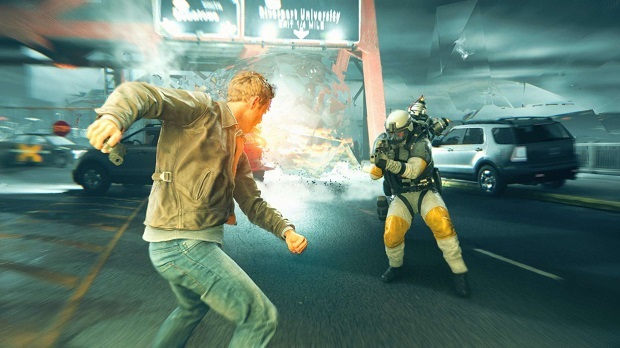 Remedy Entertainment’s time-bending narrative driven action adventure, Quantum Break, will also be joining the ever-growing list of games available on Microsoft’s service, while Onrush, Codemasters’ arcade action racing title, follows suit. Quantum Break is an amazing game, albeit with a few flaws of its own, that is absolutely worth playing (read our review), so if you haven’t tried it out yet, now’s the perfect chance. On the other hand, Onrush is also a pretty flawed title, much more so than others mentioned so far, in fact, but still worth playing for the fresh and different things it tries to execute. There’s also the fact that it hasn’t been doing very well commercially, so maybe this will provide it the boost it needs. Other than these titles, the other games being added to Game Pass are: Snake Pass, Shadow Warrior, Aven Colony, Manuel Samuel, Sky Force Reloaded, InnerSpace, and Giana Sisters: Twisted Dreams. If you’re a newcomer to Xbox Game Pass, you can currently get a subscription for just $2, with which a free subscription for a subsequent month will also be provided to you. Read more on that here.